Chef Lorna is not afraid to experiment and try new things in Calvary’s Good Hope Kitchen. 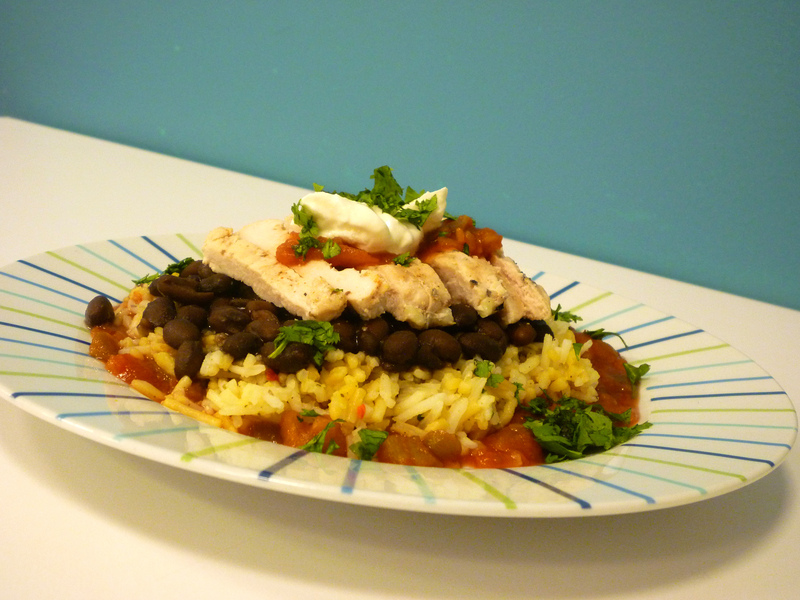 Recently she was inspired to create a variation on a Mexican chicken dish that she ordered at one of her favorite restaurants. It took a few tries to get the recipe just right and make it her own, but the result was worth the trials. One of the secrets, Lorna says, is to punch up the flavor by substituting jasmine rice with Mexican rice, and plum tomatoes with salsa. Residents at Calvary will never be bored at dinnertime as long as Lorna’s flare for experimentation continues! You can try out this festive and colorful summer dish in your own kitchen. Let us know what you think by leaving a comment! Pound the chicken breasts and season with salt, pepper and garlic powder. Grill the chicken until it is no longer pink in the middle. Allow the chicken to rest before slicing into thin strips. Drain and rinse the beans and combine with cumin and chili powder in a sauce pan. Mix thoroughly and simmer for 10 minutes. Prepare the rice according to package directions. For added flavor, prepare 2 cups jasmine rice and 2 cups of Mexican rice and combine. Dice the tomatoes and arrange them on a plate (you can also use salsa). Add a layer of the rice, followed by a layer of black beans. Squeeze a quarter of a lime over the rice and beans. Add chicken strips on top of the beans. Top with diced tomatoes, a pinch of cilantro and a lime wedge.